Steptoe and Son (MGM-EMI,1972) British Quad 30"x40"
Comedy featuring Wilfrid Bramble and Harry H Corbett. 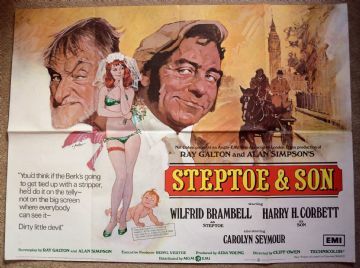 Albert Steptoe and his son Harold are junk dealers, complete with horse and cart to tour the neighbourhood. They also live amicably together at the junk yard. But Harold, who likes the bright lights in the West End of London, meets a stripper. Fine, but he marries her and takes her home. Albert, of course, is furious and tries every trick he knows to drive the new bride from his household. The poster displays incredibly well.